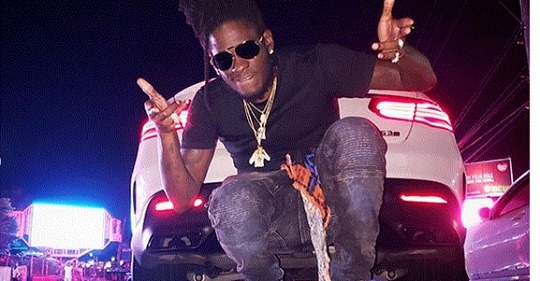 Iconic Dancehall artiste Sheldon Aitana Lawrence aka Aidonia has reportedly crashed his Benz car between late last night and early this morning while traveling along Mannings Hill Road in St, Andrew. It’s still unclear what caused this accident even though many are suspecting it to be as a result of speeding. Based on published visuals it would appear that this was a single car accident and no other motor vehicle was involved. It’s also still unclear as to Aidonia’s current condition as the artist himself is yet to report on the matter. On a positive note Persons around the accident scene made comments that he was alive but shaken up. By looking at his damaged vehicle it would be almost impossible for him to leave that car without a scrape or couple bruises. Footage shows the front end of Aidonia’s Benz Van completely damaged. Aidonia might have been leaving from FIYAH party/event which he was booked to perform at on the 13th(last night). Numerous videos have been circulating online like the ones below with the aftermath of the crash. “god deh pan him side” says this woman recording the video below!